Please go right ahead and modify this face to your liking - it's why I included the mrh file! If you decide to release a modification to this morph at any point, please credit me - and go ahead and let me know too if you like, I'd love to see your work! 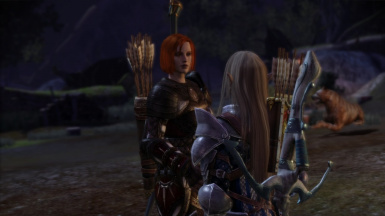 If you're anything like me then you probably thought that unmodded, Leliana's face is very nnnnnnnnhgh. She looks angry, even during her romance scene (smouldering rage as you kiss me) and her singing scene is just facial stretching to the max (but that can hardly be completely eliminated anyway). 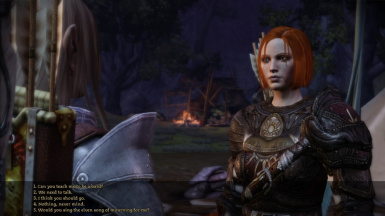 Unfortunately most of the mods I've found that change her face change her too much and weren't really satisfying for me. So, necessity being the mother of invention, I decided to take matters into my own hands and change her myself. 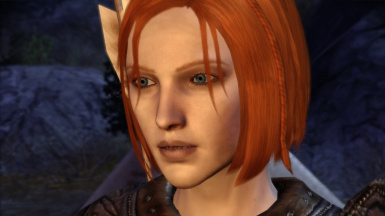 I used the DA2 version of Leliana as a point of reference, but it's not going to be 100% accurate, mainly because it's hard to change how those eyebrows work. I'm quite satisfied with what I did though, so I'm going to upload it for maybe other people to enjoy!